Tip: Checks. Due to the onslaught of electronic check collection, the Federal Reserve now processes paper checks at just one location nationwide, down from 45 locations in 2003. But many individuals may not know why the bill is issued by the Federal Reserve and what role the Federal Reserve plays in the economy. Here’s an inside look. The Federal Reserve, often referred to as the Fed, is the country’s central bank. It was founded by Congress in 1913 to provide the nation with a safer, more flexible, and more stable monetary and financial system.2 Prior to its creation, the U.S. economy was plagued by frequent episodes of panic, bank failures, and limited credit. Fast Fact: Unwieldy Patchwork. In the early 1800s, the U.S. had no central bank and no common currency. The monetary system ran through a patchwork of state-chartered banks with no federal regulation. By 1860, there were nearly 8,000 of these banks, each issuing its own banknotes. It’s important to remember that “the Fed” cannot directly control employment, inflation, or long-term interest rates. Rather, it uses a number of tools at its disposal to influence the availability and cost of money and credit. This, in turn, influences the willingness of consumers and businesses to spend money on goods and services. For example, if the Fed maneuvers short-term interest rates lower, borrowing money becomes less expensive and people may be motivated to spend. Consumer spending may stimulate economic growth, which may cause companies to produce more product and potentially increase employment. When short-term rates are low, the Fed closely monitors economic activity to watch for signs of rising prices. On the other hand, if the Fed pushes short-term rates higher, borrowing money becomes more expensive and people may be less motivated to spend. This may, in turn, slow economic growth and cause companies to decrease employment. When short-term rates are high, the Fed must watch for signs of a decline in overall price levels. The Fed establishes and enforces the regulations banks, savings and loans, and credit unions must follow. It works with other federal and state agencies to ensure these financial institutions are financially sound and consumers are receiving fair and equitable treatment. When an organization is found to have problems, the Fed uses its authority to have the organization correct the problems. The Fed maintains the stability of the financial system by providing payment services. In times of financial strain, the Fed is authorized to step in as a lender of last resort, providing liquidity to an individual bank or the entire banking system. For example, the Fed may step in and offer to buy the government bonds owned by a particular bank. By so doing, the Fed provides the bank with money that it can use for its own purposes. The Fed provides financial services to banks and other depository institutions and to the U.S. government. For banks, savings and loans, and credit unions, it maintains accounts and provides various payment services, including collecting checks, electronically transferring funds, distributing new money, and receiving and destroying old, worn-out money. For the federal government, the Fed pays Treasury checks; processes electronic payments; and issues, transfers, and redeems U.S. government securities. Each day, the Fed is behind the scenes supporting the economy and providing services to the U.S. financial system. And while the Fed’s duties are many and varied, its focus is to maintain confidence in banking institutions. 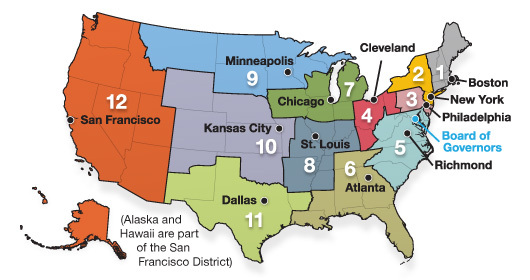 The Federal Reserve System consists of 12 independent banks that operate under the supervision of a federally appointed Board of Governors in Washington, D.C. Each of these banks works within a specific district, as shown. Securities and Advisory Services through UNITED PLANNERS FINANCIAL SERVICES Member: FINRASIPC. Pacific Financial Group and United Planners are independent companies and are not affiliated.